"It began with a closed, deserted diner, and a man too long without sleep to continue his journey. It began with the landing of a craft from another galaxy. Now, David Vincent knows that The Invaders are here. That they have taken human form. Somehow he must convince a disbelieving world that the nightmare has already begun…"
Remember The Invaders, that late-1960s television series starring Roy Thinnes as architect David Vincent? Vincent discovers that aliens are secretly invading Earth. Planetary conquest is their mission and each week they embark on another nefarious plan that Vincent barely manages to disrupt at the last possible moment, using only his wits, his courage and his apparently inexhaustible supply of lawyers, guns and Ford Mustangs. Although they have assumed human form, the Invaders' disguise is not perfect; often an Invader's pinky finger is crooked or malformed, they have no heartbeat, and they must regenerate every few days or else they will revert to their natural form which cannot survive on Earth. And when they die, they burn up a red flame that leaves only small lumps of ash behind, leaving no evidence to support Vincent's "wild" conspiracy theories. The Invaders is really an exercise in paranoia. Vincent never knows who to trust or who to believe. He can't gather evidence -- the aliens either destroy it or, in the case of the aliens themselves, are destroyed. Aliens who have secretly assumed positions of power block his investigations. Even when he finds others who believe him, they are also powerless to help him. And although the show wallows in the stylistic trappings of 1960s tv (for instance, nearly everyone carries a gun and starts shooting with little provocation, with no apparent legal intervention or repercussion), the series often overcomes its reliance on formula with interesting scripts and top-notch acting acting anchored by its lead, Roy Thinnes. 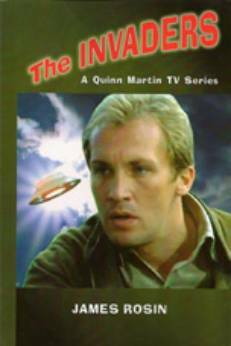 James Rosin's recent book The Invaders: A Quinn Martin TV Series sheds some light of the making of the series. Spilt into four sections, the first part delves into the creation and production of the series, highlighted with interviews with many of the surviving players including show creator Larry Cohen, proucer Alan Armer and star Roy Thinnes. They discuss the creation of the show, how executive producer and TV legend Quinn Martin became involved. Martin was just finishing producing The Fugitive, a popular show with a similar premise, a lead character who knows the truth, but no one in authority believes him. Rosin's interviews take the reader through the pilot episode, then through the production of the first season, and through the format change midway into the second season when Vincent is joined by several allies in his battle with the aliens. As related by the cast and crew, it was a struggle to adapt to the new format, as the paranoia aspect gave way to more pedestrian action-adventure stories. Although the interview segments are short, it's clear that many involved with the production, particularly Thinnes, regard The Invaders as a highlight of their careers. He tells of a visit to Paris to attend a screening of an episode in a movie theatre and his amazement that the audience was reciting the dialogue as the episode went along. This section is the real "meat" of the book, and one wishes it was longer, but there is still plenty of well-presented information here to whet the appetite of both the show's fans in particular and television aficionados in general. Part two of the book is an extensive photo section. While more behind the scenes photos would have been appreciated, the photos provided illuminate the truth of something revealed in the interviews -- that Quinn Martin's shows always had stellar guest casts because guests stars got paid more on his shows than any other. A virtual who's-who of 1960s acting talent is revealed here: James Daly, Suzanne Pleshette, a pre-Hawaii Five-O Jack Lord, Alfred Ryder, James Whitmore, Peter Graves, Susan Oliver, Michael Rennie, Burgess Meredith, Anne Francis, Kevin McCarthy, Dawn Wells, Barry Morse, Fritz Weaver, and Gene Hackman (fresh off shooting a movie that would change his career, Bonnie and Clyde). Next up is a nicely laid out and comprehensive episode guide, with each episode indexed, and a plot summary and a cast list provided. Having recently watched the series again for the first time in many years, this was a refresher for some of my favourite episodes. The book concludes with a exhaustive list of credits for many of the crew and guest cast. 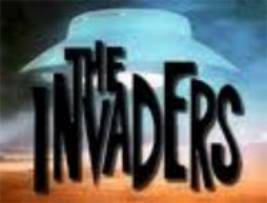 This is by no means a definitive look at The Invaders, but it certainly is an excellent starting point for someone wanting to delve a little deeper in the backstory of this cult TV show. Originally in Neo-opsis issue 19.